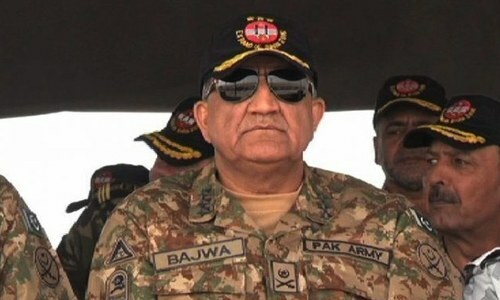 Army Chief Gen Qamar Javed Bajwa on Tuesday travelled to Kabul for a day-long visit during which he held a one-on-one meeting with Afghan President Ashraf Ghani and engaged in delegation-level discussions on issues of bilateral interest, read a press release issued by the Inter-Services Public Relations (ISPR). During the trip that was reportedly made on the Afghan president's invitation, the army chief also held meetings with Chief Executive Abdullah Abdullah and the top US commander in Afghanistan Gen John Nicholson. According to ISPR, Gen Bajwa during his engagements "congratulated Afghanistan authorities on recent peace initiatives especially in respect of the Holy month of Ramazan/Eid", a reference to the week-long ceasefire with the Taliban announced by Ghani last week. "[The COAS] wished that these steps gain more of permanence, ultimately leading towards an enduring peace," said ISPR. According to ISPR, various issues came under discussion between the two sides including the ongoing efforts for reconciliation in Afghanistan, measures needed to check the rise of the militant Islamic State (IS) group and terrorists benefiting from a porous Pak-Afghan border "to indulge in terrorism, smuggling and drug trafficking". Gen Bajwa in his meeting stressed that peace and development were crucial for countries to grow as a region, and not individually. Summarising Pakistan's efforts towards progress, the army chief said the country after achieving relative peace and stability was now focused on socio-economic development "as a route towards enduring peace and stability". The army chief said that the recently concluded Afghanistan Pakistan Action Plan for Peace and Stability (APAPPS) is expected to lead to more cooperation and coordination between the two countries. While referring to Pakistan's border fencing measures, Gen Bajwa said the fence is "an obstacle for checking terrorism and not between people of both sides". Ghani, who hosted the Pakistani delegation at the presidential palace, thanked Gen Bajwa for his visit and recent security initiatives undertaken for peace and stability, the ISPR reported. Ghani in his remarks shared the outline of his vision for regional development, efforts to extend the ongoing temporary ceasefire with the Taliban and steps related to creating conditions for reconciliation. "Both sides agreed that while results of the bilateral initiatives are extremely important, [...] even more important is the continuity of the processes to achieve the end state objectives," said the ISPR statement. In a conversation with Resolute Support Mission (RSM) Commander Gen John Nicholson, Gen Bajwa said that Pakistan desires that US and Nato forces succeed in ending violence and "leave behind a peaceful and stable Afghanistan". A guard of honour was earlier presented to the COAS when he arrived for the meetings. 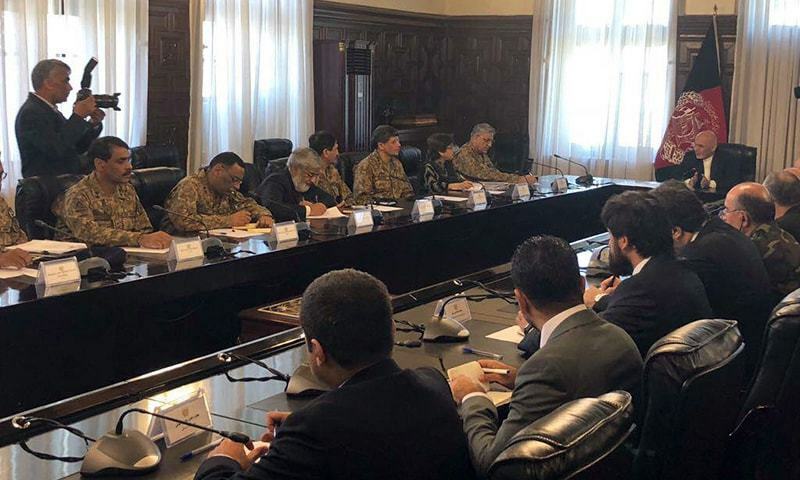 Foreign Secretary Tehmina Janjua, Director General ISI Lt Gen Naveed Mukhtar, the Pakistani ambassador in Afghanistan and other senior officials accompanied the COAS on his visit. The Afghan delegation was comprised of the country's national security advisor, National Directorate of Security officials and senior ministers. The optimism from Afghanistan and Pakistan about the new peace initiative came on a day when Taliban fighters killed an Afghan governor and took control of his district as clashes broke out across the country despite the start of a government ceasefire. Ghani had announced last Thursday that police and troops would halt hostilities with the Taliban for eight days, from June 12-19 — though he warned that operations against other insurgents, including IS militants, would continue. The Taliban said on Saturday their fighters would stop attacking Afghan security forces but only for the first three days of Eid. They said they would continue assaults on US-led Nato troops. Analysts had expressed cautious optimism that the ceasefire offers could help build trust between the government and the Taliban and lay the groundwork for peace talks. 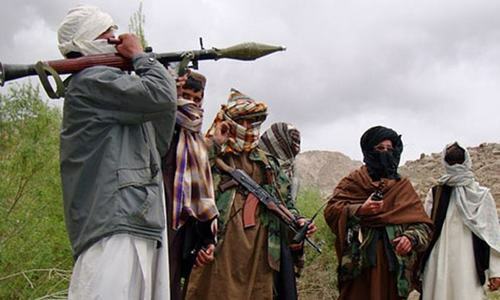 The spokesman of Ghazni province's governor, Arif Noori, blamed the Taliban for an attack on a district government building, although no group has so far claimed responsibility. 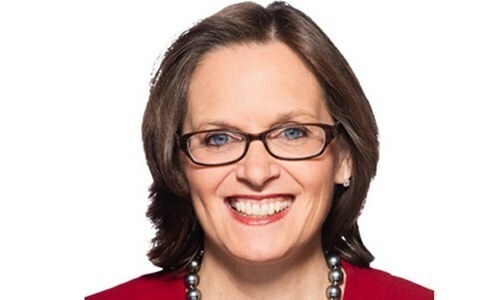 How I wish an elected leader would do this. Finally, Afghanistan and US have realized that victory can only be achieved with Pakistan's help. Pakistan army with delegation, meets Ghani, instead of Pakistan civilian government. It would be better if civilian Afghan officials engage with their civilian Pakistani counterparts. These types of meetings are not sending a good message to the rest of the world. Unlike some of his predecessors, Mr Bajwa is genuinely a peacelover and a forward thinker. No where in the world an army chief would act like a diplomat! What happened to civilian government? Y a general is running the foreign policy? Similar peace initiatives have taken place in the past but to no avail so what is different this time around. @Narinder Singh Parvana : Because Politicians are busy looting the country and have no clue about what is going on around the world. @Faisal No, because only Army has full authority on all matters involving India and Afghanistan.